Hey everyone, I am back again with a card for Quick Creations. I have coloured up Kraftin’ Kimmies, Witch Willa with my copic markers. When colouring this darling image up, I tried something a bit different for me, and used my W7, and W5 markers to add some really deep shadows to the image instead of going in after with my coloured pencils. I really enjoy the effect it gave adding those colours before going in with the colour I wanted that actually are to be. I finished off card by placing it on a couple pieces of Echo Park – Magical Adventures – Dots and Stripes paper and calling it good. I haven’t been doing much in the way of simple cards lately and I love this one, especially since I made 10 of them for in with the treat bags for my sons class for Halloween. Hey everyone! Today I have a card for Quick Creations, featuring Stamping Bella – Tiny Townies – Haley the Hero and Echo Park’s Magical Adventures Dot’s and Stripes Paper. I do have a video of colouring this one that will be up on My Youtube Channel shortly. I have been doing a lot of big over the top cards lately so I kept this one nice and simple, some super cute patterned paper and a ribbon and I called her done! Hey everyone, today I have a card featuring Connie Fong’s – Sally and Little Squirrel, and Creative Basics Dies. I coloured my image up with my Faber-Castell Polychromos pencils. I used Blue Fern Studio papers, Creative Basics Fancy Rectangles & Layers Die Set, and Basic Stitched Flags. Some lace, Wild Orchid Crafts Flowers and some berries finish off the front of this shabby card. Today is RELEASE DAY for all of the new OCTOBER Products at C.C. Designs!! As you have seen from our Preview Days, this release revolves around Christmas (which is right around the corner folks)!! For the month of October, we have 15 new character stamps, 4 dies, a Holiday Background stamp set, and a new Sentiment set. I have said it before, but Cinnamon is ever so sweet! I have coloured up Elf Cinnamon with my copic markers, and fussy cut her out. I then cut a tag using the Layering Tag DiesLayering Tag Dies on white cardstock and ink blended it blue. I layered her on top and added some white drops of various sizes all over the tag. *This Blog Hop will end on Sunday, OCTOBER 9th at NOON, 12pm EST. 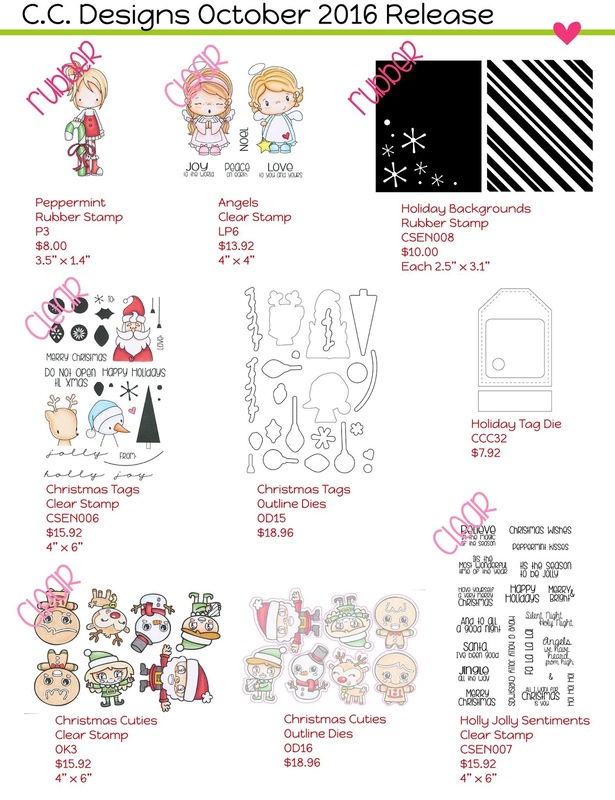 Hey everyone, today I have a new release digital stamp from Power Poppy – Fall Haul to share with you all. I printed my image onto copic xpress-it blending card and coloured it with copic markers then enhanced everything with coloured pencils. I used the Creative Basics – Cutting Edge Borders 1 , and cut the top with the stitched curved die and let a bit of patterned paper peek out!